Israel's cleantech community was out in force this morning in Ramat HaSharon. 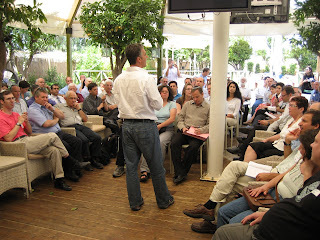 Approximately 130 investors, entrepreneurs, service providers, and "high-tech refugees" attended the latest Cleantech Israel meetup, where they had an opportunity to network and hear a presentation by Dr. Isaac Berzin. To get a participant's perspective on the event, check out Karin Kloosterman at TreeHugger and Tali Aben's blog post. What started three months ago in a coffee shop in Herzliya seems to have grown into something much larger. It has been an honor and a pleasure to be involved in the group's founding and development, and I look forward to seeing what comes next. As I announced at this morning's meeting, the group is now going "global" with the establishment of the Boston Israel Cleantech Alliance. Please check out the web site and contact me if you want to get involved. "A Renewable Light Unto the Nations"
JTA: "Israeli firms invest in clean tech"